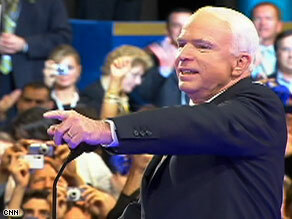 McCain: Thank you. Thank you all very much. Thank you. Tonight, I have a privilege given few Americans: the privilege of accepting our party's nomination for president of the United States. Thank you. I -- and I accept it with gratitude, humility, and confidence. In my life, no success has come without a good fight, and this nomination wasn't any different. That's a tribute to the candidates who opposed me and their supporters. They're leaders of great ability who love our country and wish to lead it to better days. Their support is an honor that I won't forget. I'm grateful to the president of the United States for leading us in these dark days following the worst attack in American history. The worst attack on American soil in our history and keeping us safe from another attack that many -- many thought was inevitable. And to the first lady, Laura Bush, a model of grace and kindness in public and in private. ... for their outstanding example of honorable service to our country. As always, I'm indebted to my wife, Cindy, and my seven children. You know, the pleasures of family life can seem like a brief holiday from the crowded calendar of our nation's business. But I have treasured them all the more and can't imagine a life without the happiness that you've given me. You know, Cindy said a lot of nice things about me tonight. But, in truth, she's more my inspiration than I am hers. Her concern for those less blessed than we are -- victims of land mines, children born in poverty, with birth defects -- shows the measure of her humanity. And I know that she will make a great first lady. My friends, when I was growing up, my father was often at sea, and the job of raising my brother, sister and me would fall to my mother alone. Roberta McCain gave us her love of life, her deep interest in the world, her strength, and her belief that we're all meant to use our opportunities to make ourselves useful to our country. I wouldn't be here tonight but for the strength of her character. And she doesn't want me to say this, but she's 96 years young. My heartfelt thanks to all of you who helped me win this nomination and stood by me when the odds were long. I won't let you down. I won't let you down. I won't let you down. To Americans who have yet to decide who to vote for, thank you for your consideration and the opportunity to win your trust. I intend to earn it. And, finally, a word to Sen. Obama and his supporters. We'll go at it -- we'll go at it over the next two months -- you know that's the nature of this business -- and there are big differences between us. But you have my respect and my admiration. Despite our differences, much more unites us than divides us. We are fellow Americans, and that's an association that means more to me than any other. We're dedicated to the proposition that all people are created equal and endowed by our creator with inalienable rights. No country -- no country ever had a greater cause than that. And I wouldn't be an American worthy of the name if I didn't honor Sen. Obama and his supporters for their achievement. But let there be no doubt, my friends: We're going to win this election. And after we've won, we're going to reach out our hand to any willing patriot, make this government start working for you again, and get this country back on the road to prosperity and peace. Please, please, please. My friends, my dear friends, please. Please don't be diverted by the ground noise and the static. You know, I'm going to talk about it some more. But Americans want us to stop yelling at each other, OK? These are tough times for many of you. You're worried about keeping your job or finding a new one, and you're struggling to put food on the table and stay in your home. Gov. Sarah Palin of the great state of Alaska. And I want to thank everyone here and all over America for the tremendous, wonderful, warm reception you gave her last night. Thank you so much. She deserves it. What a great beginning. You know, she has an executive experience and a real record of accomplishment. She's tackled tough problems, like energy independence and corruption. She's balanced a budget, cut taxes, and she's taken on the special interests. She's reached across the aisle and asked Republicans, Democrats, and independents to serve in her administration. She's the wonderful mother of five children. She's -- she's helped run a small business. She's worked with her hands and knows -- and knows what it's like to worry about mortgage payments, and health care, and the cost of gasoline and groceries. She knows where she comes from, and she knows who she works for. She stands up for what's right, and she doesn't let anyone tell her to sit down. I'm very proud to have introduced our next vice president to the country, but I can't wait until I introduce her to Washington. And let me just offer an advance warning to the old, big-spending, do-nothing, me first, country second crowd: Change is coming. I'm not -- I'm not in the habit of breaking my promises to my country, and neither is Gov. Palin. And when we tell you we're going to change Washington and stop leaving our country's problems for some unluckier generation to fix, you can count on it. We've got a record of doing just that, and the strength, experience, judgment, and backbone to keep our word to you. ... someone who marches to the beat of his own drum. Sometimes it's meant as a compliment; sometimes it's not. What it really means is I understand who I work for. I don't work for a party. I don't work for a special interest. I don't work for myself. I work for you. I've fought corruption, and it didn't matter if the culprits were Democrats or Republicans. They violated their public trust, and they had to be held accountable. I've fought the big spenders in both parties, who waste your money on things you neither need nor want, and the first big-spending pork-barrel earmark bill that comes across my desk, I will veto it. I will make them famous, and you will know their names. You will know their names. We're not going to allow that while you struggle to buy groceries, fill your gas tank, and make your mortgage payment. I've fought to get million-dollar checks out of our elections. I've fought lobbyists who stole from Indian tribes. I've fought crooked deals in the Pentagon. I've fought tobacco companies and trial lawyers, drug companies and union bosses. And when the pundits said -- when the pundits said my campaign was finished, I said I'd rather lose an election than see my country lose a war. ... that -- that strategy succeeded, and it rescued us from a defeat that would have demoralized our military, risked a wider war, and threatened the security of all Americans. ... lost their real estate investments in the bad housing market. Bill got a temporary job after he was out of work for seven months. Sue works three jobs to help pay the bills. Jake works on a loading dock, coaches Little League, and raises money for the mentally and physically disabled. Toni is a schoolteacher, working toward her master's degree. They have two sons. The youngest, Luke, has been diagnosed with autism. Their lives should matter to the people they elect to office. And they matter to me. And they matter to you. I fight for the family of Matthew Stanley of Wolfeboro, New Hampshire. Matthew died serving our country in Iraq. I wear his bracelet and think of him every day. I intend to honor their sacrifice by making sure the country their son loved so well and never returned to remains safe from its enemies. We lost -- we lost the trust of the American people when some Republicans gave in to the temptations of corruption. We lost their trust when rather than reform government, both parties made it bigger. We lost their trust when instead of freeing ourselves from a dangerous dependence on foreign oil, both parties -- and Sen. Obama -- passed another corporate welfare bill for oil companies. We lost their trust when we valued our power over our principles. We're going to recover the people's trust by standing up again to the values Americans admire. The party of Lincoln, Roosevelt and Reagan is going to get back to basics. In this country, we believe everyone has something to contribute and deserves the opportunity to reach their God-given potential, from the boy whose descendents arrived on the Mayflower to the Latina daughter of migrant workers. We're all God's children, and we're all Americans. We believe -- we believe in low taxes, spending discipline, and open markets. We believe in rewarding hard work and risk-takers and letting people keep the fruits of their labor. ... personal responsibility, the rule of law, and judges who dispense justice impartially and don't legislate from the bench. We believe in the values of families, neighborhoods, and communities. We believe in a government that unleashes the creativity and initiative of Americans, government that doesn't make your choices for you, but works to make sure you have more choices to make for yourself. I will open new markets to our goods and services. My opponent will close them. I will cut government spending. He will increase it. My tax cuts will create jobs; his tax increases will eliminate them. My health care plan will make it easier for more Americans to find and keep good health care insurance. His plan will force small businesses to cut jobs, reduce wages, and force families into a government-run health care system where a bureaucrat... where a bureaucrat stands between you and your doctor. We all know that keeping taxes low helps small businesses grow and create new jobs. Cutting the second-highest business tax rate in the world will help American companies compete and keep jobs from going overseas. Doubling the child tax exemption from $3,500 to $7,000 will improve the lives of millions of American families. Reducing government spending and getting rid of failed programs will let you keep more of your own money to save, spend, and invest as you see fit. Opening new markets and preparing workers to compete in the world economy is essential to our future prosperity. I know some of you have been left behind in the changing economy, and it often sees that your government hasn't even noticed. Government assistance for the unemployed workers was designed for the economy of the 1950s. That's going to change on my watch. Now, my opponent promises to bring back old jobs by wishing away the global economy. We're going to help workers who've lost a job that won't come back find a new one that won't go away. We will prepare them for the jobs of day -- of today. We will use our community colleges to help train people for new opportunities in their communities. For workers in industries -- for workers in industries that have been hard-hit, we'll help make up part of the difference in wages between their old job and a temporary, lower paid one, while they receive re-training that will help them find secure new employment at a decent wage. Education -- education is the civil rights issue of this century. We need to shake up failed school bureaucracies with competition, empower parents with choice. Let's remove barriers to qualified instructors, attract and reward good teachers, and help bad teachers find another line of work. When a public school fails to meet its obligations to students, parent -- when it fails to meet its obligations to students, parents deserve a choice in the education of their children. And I intend to give it to them. Sen. Obama wants our schools to answer to unions and entrenched bureaucrats. I want schools to answer to parents and students. And when I'm president, they will. My fellow Americans, when I'm president, we're going to embark on the most ambitious national project in decades. We'll attack -- we'll attack the problem on every front. We'll produce more energy at home. We will drill new wells off-shore, and we'll drill them now. We'll drill them now. We'll -- we'll -- my friends, we'll build more nuclear power plants. We'll develop clean-coal technology. We'll increase the use of wind, tide, solar, and natural gas. We'll encourage the development and use of flex-fuel, hybrid and electric automobiles. Sen. Obama thinks we can achieve energy independence without more drilling and without more nuclear power. But Americans know better than that. We must use all resources and develop all technologies necessary to rescue our economy from the damage caused by rising oil prices and restore the health of our planet. ... it's an ambitious plan, but Americans are ambitious by nature, and we've faced greater challenges. It's time for us to show the world again how Americans lead. This great national cause will create millions of new jobs, many in industries that will be the engine of our future prosperity, jobs that will be there when your children enter the workforce. Today -- today, the prospect of a better world remains within our reach. But we must see the threats to peace and liberty in our time clearly and face them as Americans before us did: with confidence, wisdom, and resolve. And the brave people of Georgia need our solidarity and our prayers. As president, I'll work to establish good relations with Russia so that we need not fear a return to the Cold War. But we can't turn a blind eye to aggression and international lawlessness that threatens the peace and stability of the world and the security of the American people. I know how the military works, what it can do, what it can do better, and what it shouldn't do. I know how the world works. I know the good and the evil in it. I know how to work with leaders who share our dreams of a freer, safer and more prosperous world, and how to stand up to those who don't. My friends, when I was 5 years old, a car pulled up in front of our house. A Navy officer rolled down the window and shouted at my father that the Japanese had bombed Pearl Harbor. I rarely saw my father again for four years. My grandfather came home from that same war exhausted from the burdens he had borne and died the next day. In Vietnam, where I formed the closest friendships of my life, some of those friends never came home with me. I'm running for president to keep the country I love safe and prevent other families from risking their loved ones in war as my family has. I will draw on all my experience with the world and its leaders, and all the tools at our disposal -- diplomatic, economic, military, and the power of our ideals -- to build the foundations for a stable and enduring peace. We need to change the way government does almost everything: from the way we protect our security to the way we compete in the world economy; from the way we respond to disasters to the way we fuel our transportation network; from the way we train our workers to the way we educate our children. All these functions of government were designed before the rise of the global economy, the information technology revolution, and the end of the Cold War. We have to catch up to history, and we have to change the way we do business in Washington. Again and again -- again and again, I've worked with members of both parties to fix problems that need to be fixed. That's how I will govern as president. I will reach out my hand to anyone to help me get this country moving again. ... I have that record and the scars to prove it. Sen. Obama does not. Instead -- instead of rejecting good ideas because we didn't think of them first, let's use the best ideas from both sides. Instead of fighting over who gets the credit, let's try sharing it. This amazing country can do anything we put our minds to. I'll ask Democrats and Independents to serve with me. And my administration will set a new standard for transparency and accountability. Long ago, something unusual happened to me that taught me the most valuable lesson of my life. I was blessed by misfortune. I mean that sincerely. I was blessed because I served in the company of heroes and I witnessed a thousand acts of courage, and compassion, and love. On an October morning, in the Gulf of Tonkin, I prepared for my 23rd mission over North Vietnam. I hadn't any worry I wouldn't come back safe and sound. I thought I was tougher than anyone. I was pretty independent then, too. I liked to bend a few rules and pick a few fights for the fun of it. But I did it for my own pleasure, my own pride. I didn't think there was a cause that was more important than me. Then I found myself falling toward the middle of a small lake in the city of Hanoi, with two broken arms, a broken leg, and an angry crowd waiting to greet me. I couldn't do anything. I couldn't even feed myself. They did it for me. I was beginning to learn the limits of my selfish independence. Those men saved my life. Through taps on a wall, he told me I had fought as hard as I could. No man can always stand alone. And then he told me to get back up and fight again for my country and for the men I had the honor to serve with, because every day they fought for me. I loved it because it was not just a place, but an idea, a cause worth fighting for. I was never the same again; I wasn't my own man anymore; I was my country's. I'm not running for president because I think I'm blessed with such personal greatness that history has anointed me to save our country in its hour of need. Enlist in our Armed Forces. Become a teacher. Enter the ministry. Run for public office. Feed a hungry child. Teach an -- an illiterate adult to read. Comfort the afflicted. Defend the rights of the oppressed. I'm going to fight for my cause every day as your president. I'm going to fight to make sure every American has every reason to thank God, as I thank him, that I'm an American, a proud citizen of the greatest country on Earth. And with hard work -- with hard work, strong faith, and a little courage, great things are always within our reach. Fight with me. Fight with me. Fight for what's right for our country. Fight for the ideals and character of a free people. Fight for our children's future. Fight for justice and opportunity for all. Stand up to defend our country from its enemies. Stand up for each other, for beautiful, blessed, bountiful America. Stand up, stand up, stand up and fight. Nothing is inevitable here. We're Americans, and we never give up.